Lace up your walking shoes. It’s SF’s annual art fair weekend, highlighted by the sixth edition of Art Market San Francisco at Fort Mason, and the return of two events launched last year: the sTARTup Art Fair at Hotel del Sol, and the Parking Lot Art Fair, now at the Fort Mason Parking lot opposite the Marina Boulevard Safeway Together they literally cover the waterfront. 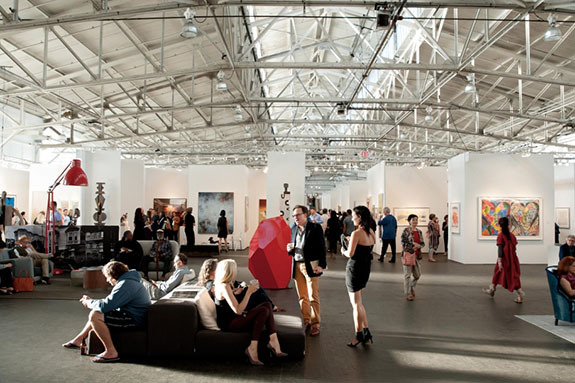 Art Market SF, having thrived amidst speculation as to whether San Francisco could support even one art fair, much less the five it presently hosts, last year attracted more than 25,000 visitors over five days and chalked up strong sales at every price point. It’s the creation of Brooklyn-based Art Market Productions, a company led by Jeffrey Wainhause and Max Fishko. Since pioneering the SF fair, the team has launched successful fairs in New York, Seattle, Miami, the Hamptons and Houston. This year, with 70 participating galleries (the vast majority from the Bay Area) Art Market SF promises, at minimum, a repeat performance. For a list of participating galleries click here. Presentation highlight: Curator Karin Breuer speaks about the Ed Ruscha exhibition opening in July at the de Young. Saturday April 30, noon to 1 p.m. The giveback: Wednesday night’s preview reception benefits the Fine Arts Museums of San Francisco. Art Market SF: April 27 to May 1 @ Fort Mason Center. Surprises, if any, are likely to turn up at the two fairs whose identities are now being forged: the sTARTup Art Fair, launched last year by dealer Steve Zavattero and artist Ray Beldner, and the Parking Lot Art Fair, organized by the painter Jenny Scharaf. Among the two, the most unique is the sTARTup fair. That is because it is a curated event for which the artists, most of them unrepresented by galleries, pay to participate. To gain entry artists must pass muster with a selection committee comprised of respected art professionals, which this year includes: Michael Arcega, Hung Liu, Max Presneill, Renny Pritikin, Alex Ray and Marianna Stark. Initially, there were grumblings about the pay-to-play aspect, but they quickly faded. The consensus that emerged was: this is a well-run, well-curated event, one that for a number of artists, turned out to be profitable, both in sales made and in curator/collector connections established. For visitors, the draw was the ability to meet and converse with artists in an intimate environment – two things not possible at convention hall/booth fairs. As such, the sTARTup fair filled the void left by the 2013 departure of ArtPad, the hotel fair/pool party that laid the template for such events in SF. Were there awkward moments? Yes, there were. Not all artists were adept at speaking about their work; some arrived woefully unprepared and would have been better served by galleries at conventional art fairs. Others operated like seasoned pros and reaped the benefits. Last year the sTARTup fair attracted more than 60 participants and more than 3,500 paid visitors. This year 43 artists will be exhibiting. For a complete of participants click here. In addition there will be rooms curated by several nonprofit galleries: Root Division, San Jose Institute for Contemporary Art (with Stephen Wirtz and David Pace serving as curators), ArtSpan, Drawbridge, EmbarkGallery and Shipyard Trust for the Arts. In addition, Justin Hoover, Creative Director at Fort Mason Center for Arts and Culture, has filled the public spaces of the hotel with an installation called Rituals of Technowhere. The giveback: 50% of ticket sales go to Root Division and San Jose Institute of Contemporary Art. Artists keep 100% of all sales. Presentation highlight: Cathy Kimball, director of the San Jose ICA, will moderate a panel discussion, “Assessing the Value of Creativity.” Saturday, April 30 at 1 p.m. Notable upshot: At the conclusion of last year’s fair, Zavattero and Beldner announced they would launch a similar event in LA. It debuted in January to rave reviews. 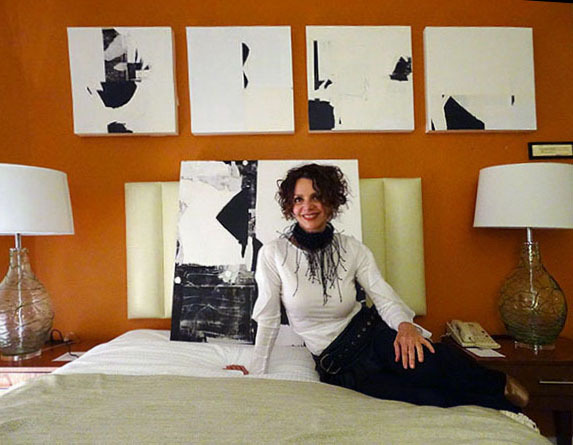 sTARTup Art Fair: April 29 to May 1 @ Hotel de Sol, 3100 Webster St., SF. Last year’s Parking Lot Art Fair was a guerilla event. It went up before dawn and was taken down before noon; the location was announced on Facebook only an hour before it opened. This year the fair’s gone legit. It has a permit, meaning it will operate without fear of being busted. The bigger victory, however, may be the location: the Fort Mason Parking lot. Operating out of autos and trucks, the assembled artists, many of them worthy, stand to draw attention from the hordes headed to Art Market — something that could help erase or blur the lines separating insiders from outsiders. Two hundred artists are expected. The giveback: artists keep 100% of what they earn and challenge the status quo. 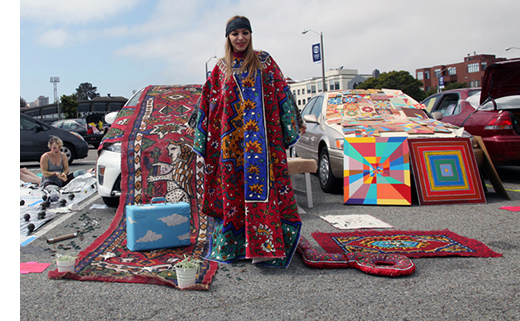 Parking Lot Art Fair: Saturday, April 30, 8 to 3 pm, Fort Mason Center parking lot, across from the Marina Boulevard Safeway.